To the best of my knowledge, there is no place online that gathers the various--freely available--Victorian and earlier cutting systems. Professional tailors--and cutters, which is a separate job, often in the same shop--use cutting systems rather than actual patterns. The main difference, of course is in fit and style--a pattern may come graded to a number of sizes, but these are still ideal and won't necessarily fit; cutting systems, on the other hand, use scales and mathematics to give proportions and how to draft for the body of the customer. They typically also have notes on modifying the draft for varying postures and such. The majority of the systems were for menswear, and that is my focus--however, there were variations for tailored ladies' clothing as well, and I will include those that I find. Currently, I have only worked off of one of these systems--I dream someday (when I win the Lotto that I don't play!) of making up a series of frock coats, one for each system in order to compare them. Anyways, the systems are arranged chronologically, by publishing date. I should note that I did not put them down in order, since they weren't found in chronological order--so when I say that it is the first I've seen that does something, or that it's the most specific yet, I don't mean chronologically. I also have not read any of these, just glanced over them to determine what makes the system different. If you decide to be brave and actually use any of these, I highly suggest writing out, or rewriting all instructions in your own words. Working it out on paper, in scale, would also likely be a good idea. I would also encourage those of you who have blogs to write a tutorial (and then put a link in the comments below) as you do the drafting--even if it is not quite correct, it may help future cutters. While the book is supposed to have fold out leaves with the diagrams, they were--for some reason--not scanned. Regardless, there is a lot of good information here. *insert gibbering excitement* This book lays claim, in the preface, to be only the second work of its type produced in English (and is the first American one). It goes into fair depth, covering the coat of the times, breeches, waistcoats, and touches upon "habits for women". Almost 160 pages--a treasure!!! As the title states, it uses a square rule for measuring and drafting. I am guessing that since this was important enough to put in the title, use of the square rule is a fairly new thing. Happily, there are images, and you should be able to work out the method. All I can say is "good luck". There are no images, so it will be quite a challenge to draft. The tailors' director, containing an important discovery for fitting the human shape by Jackson, John, teacher of cutting. (1833) Now this is decidedly interesting. He trashes the thought of only using one system being an option--because many are only designed for a slender man, and by the time you gain the experience to cut for all bodies, you'll be out of business. He goes way into depth when it comes to measuring. There is good information, but the book is lacking any images of the process. A massive treatise--over 200 pages (although looking closer, half are blank...)--using a couple of different, interesting tools (one seems to be similar to that used by nurses to measure your height). Hard to read (tiny, faint, font) but should be doable. Discusses making of the tools, and the drafting appears to be straightforwarded. Specifies that it is not based on proportions of the chest, but rather a division of the shoulder and the chest. It does use a tailor's square, which is drawn on a leaf of the book, and should be reproducable. Like many others, it uses a form of tailor's square. It shouldn't be too difficult to draft from. This is a combined system, using both proportionate measures, and direct ones. It is a very short book--more of a pamphlet. Wow. The first which is set up as a Question and Answer. Actually should make it easier to follow, except the pages are terribly faded. It contains basic drafting for both gentlemen's and ladies' garments. Der zuschneider wie er sein soll, oder, Gründliche anweisung zum selbst-unterricht im zuschneiden by Geer, Salomon (1854) In German. I /think/ this is a direct measure system. This is a German system. Sadly, no instructions are given. However, with a fair amount of study--both in figuring the proportions, and in ironworking, it should be workable. There are some decidedly....interesting....drafts in here--like the Box Sack Overcoat (which appears to be a paletot with a partial waist seam and separate sidebody). Uses a simple method of measuring. He instructs you to make a proportionate tape (of paper) for the individual customer. Quite fascinating, and I suspect this is a rather old method of measuring--it just isn't discussed in detail in other books. I like it. Calls for some kind of complicated measuring harness--with some (quite a bit of) thought, you should be able to do away with it; or, if you prefer an engineering challenge, there is a drawing of the vict....client....strapped up properly. Uses 9 different drafts, based on the shoulder shape (anyone not fitting into these categories is specified as being deformed, and wadding is applied to fix the issues). Goes into great detail on the measuring, using a tape. I believe this is a direct measure system. Extremely short. Unusually, he says to not bother with the diagram in the back, but to draft directly from his instructions. Much the same as the prior edition from 1862. The prime difference is that more images are included. I think this is a direct measure form. It is decidedly brief, and would require an extra measure of study before using. As the grandoise title states, this is a direct measure method of drafting, partly based on the double shoulder measure. It doesn't actually give instructions for drafting, so that would be somewhat a pain to follow, however, there is information on where to stretch the wool and points of fit you need to pay attention to. The system was first published in 1835, and republished in this edition (presumably with updates for style). It is a direct transfer system, using specific measurements to draft. It looks complicated, but once you figure it out..... I'm tempted to play with it, actually. One of his claims is that he has tried out most of the systems and contraptions, and found them wanting. He goes into a fair amount of detail, and considers his system original; it is a direct measure, based on a block. There are some decidedly interesting garments in there, with drawings of them being worn. Particularly valuable since he gives instructions in tailoring, in the back of the book. Writing with the goal to make it easy to understand for a beginner. Fairly standard overall. One of the purposes the author states is that he (and his personal system, which is contained in this book) is a practical tailor, rather than a theoretical one. He specifies the importance of taking the measures over a coat (except chest and waist). However, the system requires a specific ruler of proportions--which is obviously not included online. So. Reading between the lines in the introduction, this is theoretical. In other words, the author is not an experienced tailor. Could definitely be interesting to attempt to follow it and produce a good garment. A scientific guide to practical cutting by Glencross, William. (1873) Like his earlier work, goes into great detail on measuring. He does seem to have changed his drafting method slightly since the 1866 book. German translation of the other 1873 William Selle book. Extremely simplified. I suspect this is a very "rock of the eye" (love that term. It essentially means "eyeballing based on experience") system. However, it does have the adjustments for various postures and such. It is a rather short book. Interestingly, they have you draft the sleeve in situ--in it's position at the armscye. Absolutely fascinating. The author really goes into the bones of the theory of cutting and balancing a garment. This book is quite probably worth reading for the general information. Thirty years at the cutting-board: being a work designed to assist the student to acquire knowledge in the art of cutting. Containing a series of diagrams laid down to measure by Larder, William. (1882) A proportionate measure system. I believe this one is based on making up a series of patterns, then adjusting for each customer. He uses an unusual combination of a T square with measuring tapes coming off each arm--intriguing. The directions are straightforwarded. A directly proportionate measure form. The instructions seem to be fairly clear. The author claims that his system requires but 4 specific measures, and with those and carefully following the drafting instructions, any body can be fit. There are some interesting garments in here as well--I am tempted to play with the system. Fairly standard, and shouldn't be difficult to follow. Measurements use a square and calls for a marked piece of cardboard rather than the caliper thingy used in the later edition. A proportionate measure system using a multiarmed squaring caliper contraption. You should be able to work without it, however--the instructions are fairly detailed. This seems quite familiar. A direct proportionate method of drafting. I think it is an earlier edition of the same theory as The Self-Instructor by Moore, Charles. This version does not use proportions--or rather, doesn't give a list of how to draft like "Keystone" and the "Superlative" systems below. Direct measure system. Other than cutting, it goes into detail on the canvassing and interlining of various garments, which is unusual and extremely helpful. As above, for children's garments. This includes an extremely wide range of garments. The Cutter's practical guide to cutting and making shirts, undergarments, collars, and specialite clothing for various occupations / by W.D.F. Vincent. Requires some guesswork. Supposedly, it has a "special" way of drafting the shoulder to better the fit. The drafting is interesting, but uses a special devise to transfer the measurements direct to draft. The intro and other information, however, is fascinating and worth reading if you plan to work professionally. The page on suppression measures also is an important read. Another block based pattern, and this book is written in English and German. It does show each step in developing the blocks, and gives information on measuring. The author starts out by saying that this system is different than any other (and that he didn't plagiarise). It seems quite simple, and I believe the author is saying that it is all in the proportions--based on the golden ratio, perhaps? It does include modifications for disproportionate drafts. This particular one does not particularly (so it claims) pay attention to current fashions, but to how to draft a proper body. Most interestingly, there is a look into the author's life in his introduction (and credentials). He also goes into discussing measurements, pointing out some issues with measuring using a narrow tape, and with using standard ease for a man with a large gut. Graduated (that is, proportioned off of the chest--1/2, 1/4, etc.) scales are to be used. It looks rather complicated, but intriguing. Quite simplified--beyond any other manual, it claims. It uses a series of blocks based on direct measures. I don't really see anything not standard for a directly proportioned draft for the period. While the title is German, oddly, it is labeled as a French-American cutting method (and was published in New York). It is written in both German and English. The American coat, vest and trousers system by Gordon, Selden Smith, (1895)Has an excellent introduction, and set of instructions on measuring (differentiating between sac and body coats, unlike every other treatise I have thus far examined. He also discusses pocket sizes based on hand width. I rather like the looks of this one. It doesn't go into too much detail--it is a proportionate system, using the client's measures. It covers trousers, frock coats (which is actually a morning coat, by the skirt draft), and waistcoats--a three piece suite. So far, it's the only one I've seen which specifies a draft for a humpbacked man. It then goes on to tell how to draft ladies' waist garments. Where it is most valuable, however, are the two pages where it shows how the pad stitching on the lapel and collar ought to go (along with cuts in the canvas). Like many, he discusses measuring; however, it is in a practical sense and explaining how the measures are used. There are also images of how to take the incline measure. Rather than drafting either proportionately, or directly, he essentially tells you how to draft two sizes (36 and 42), and how to grade it up. I don't like it. 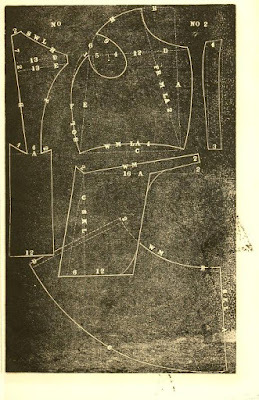 The geometric: a system of cutting garments for ladies and gentlemen on geometrical lines and principles by Denieffe, Joseph (1900)Simplified to the point of no instructions. I /think/ it is a direct measure system. Uses directly proportionate measures. One of the useful pieces is that it tells how to draft a Norfolk type coat, with working pleats. It does use proportionate measures, and have a couple modifications for different figures (corpulent, and bowlegged). In addition to more standard styles of trousers, it does include front fall trousers, and riding breeches (jodhpurs). I /think/ that this is a proportionate measure system. However, there appear to be no instructions on measuring or how to apply the measures. Wow. This is a serious book, almost philosophical. Eventually, it does get into the process of cutting. Seriously in depth, and the first one that has shrinking marks on the draft. Fairly standard and straightforwarded. The author does, however, go into more types of disproportionate body types than any of the others which I have thus far examined. First--I want to state that is a magnificent mustache being worn by the author. It is written in Italian, English, and German. This system is another proportionate one, except this time he actually takes time to explain the proportions in the beginning. It looks quite intriguing--actually seems to make some sense. In addition to standard garments, there are a few occupational ones as well. Interesting. It shows exactly how the measuring square/caliper thingy is used by laying it out on the cloth. The author is a French tailor, and Americanized the method he learned by converting it to inches. Fairly normal proportionate draft. Again, fairly simple and easy to follow. Primarily sac coats (as was fashionable by this point), it does have frock coat drafts, as well as a section on overcoats and evening dress. It is nice and in depth on some points of disproportionate bodies. Uses a double arm square to measure. Fairly standard directly proportionate measure system. The American garment cutter by Regal, Samuel (1908) This one is nice and simple. Direct measure, clear instructions and diagrams. I like it. Proportionate measure, with an excellent discussion on the tailor's square--I think this is the one Brass & Mortar Tailoring was working off of, and you might be able to get the square from him. Straightforwarded, and includes shirts in addition to the tailored clothing. Perfectly normal, and with good explanations. Staightforwarded, proportionate measure. Has drafts for a lady's jacket and skirt as well. Every day alterations; a compendium of causes, effects and remedies for the more common errors in cutting and making men's garment by Carlstrom, Jno. A (1916) Not actually a cutter's guide--this book is dedicated towards discussing the signs of an incorrect fit, and how to correct them (in future drafts, more than altering a finished garment). Same type as the one above. Popular gentleman system for cutting and designing of men's garments by Popular gentleman service company, Philadelphia. (1917) There is some interesting measuring going on here. Sac coats, trousers, and such only. New supreme system for production of men's garments by Croonborg, Frederick Timothy, (1917) Goes on about the perfect (average) man. He does spend a page discussing the tailor's square. There are two methods in here, a proportionate, and a direct. Fairly standard and organized. I think it is particularly valuable if you want to make a replica uniform, as it has the drafts and regulations for doing so. Rather interesting. This is a book on drafting ready-made working garments. Designing sack coats, dress coats and vests by Simons, Harry. (1918)Normal, and covers the standard coats of the period. A proportionate system, with decent measuring images. It is fairly easy to follow. The cutters' practical guide to the cutting of ladies' garments.. by Vincent, W. D. F. (1890) This seems extremely familiar. Standard proportionate system. Proportionate again. There are some details in here which make it worth exploring for lady's tailoring in general. The ladies' tailor complete instructor by Hughes & Storey, St. Louis. (1892)Standard proportionate theory. There is some interesting writing on running a shop, though. Unfortunately, this is only a preview on google books, since the book is still in print by Dover. However, it does have the first bit--which includes taking the measures and making the period sloper (which could be modified to produce the desired garment, possibly in conjunction with THIS pattern page). It does use a "proportionate" set of measurements. However, when it comes time to actually draft you use proportions off of your own measurements. It does not give provisions for unusual proportions and figures. A proportionate measure system....that seems to have good instructions. Text-book of the great modern system for designing and cutting ladies' garments by Rude, A. D., & son (1900) Actually appears to be fairly user friendly. As a system of cutting, it fails. However, there is a massive amount of information on stitches and tailoring techniques in dressmaking, as well as on making up the garments. Interestingly, this book claims to cover men's, ladies', and children's clothing (I suspect those are in separate books--this one only covers lady's wear). It does go over the tools, which are simple, except a curve rule--it should be possible to create a rendition of the curve rule from the image provided; it is in scale with a square. The American system of dressmaking by Merwin, Pearl (1907) A full on textbook on dressmaking. The only so far that gives a organized list of needed measures. A series of drafts, with no instructions. This is NOT a tailoring book, it is a contemporary fashion book, in French. The main reason it's being included is because I already set the link up. Weidel's instruction book for those using Weidel's combined tailor square and curves; a complete treatise on drafting ladies' and children's garments by the square and curves combined by Weidel, Joseph Anton (1910) He uses a combination square and curve tool, which could probably be reproduced. (1914 Edition) Is different from the first edition in that he uses numbers to mark pattern points, and includes drafts for slender as well as stout figures. Merz's practical cutting system for ladies' jackets and cloaks .. by Merz, William. (1911) Nothing unusual. The practical designer, for women's, misses', juniors' & children's cloaks & suits, shirt waist suits and dresses, with grading and special measurements, according to the most approved & up-to-date method; specially designed for self instruction by Rosenfeld, I. (1911) A proportionate measure method. Seems to be fairly laid out--it doesn't appear to use any special tools. Oh, dear gods. I think he's using some patented torture device to measure with. Good luck. It doesn't go into any detail on using the system. The Weiler ladies tailor--dressmaker, designer, cutter and fitter book by Weiler, Sigmond Georg (1915) This is a block based system, with an expanded pattern. Excellent instructions on taking the lady's measurements. Uses a blocking system. © John Frey, 2016. The Author of this work retains full copyright for this material. Permission is granted to make and distribute verbatim copies of this document for non-commercial private research or educational purposes provided the copyright notice and this permission notice are preserved on all copies. Photographs of my work may not be duplicated. I suspect you're right. A cursory glance says that there likely are some in there I don't have. I'll have to go through them and update, when I have a better internet connection. Thanks for sharing and bringing those pages to my attention. Holy Crap! Thank you so much. I tried tailoring with modern stuff but the cutting systems are much better for me to understand. Also vintage fashion is rad as hell. You're welcome. It really is, and modern systems (as opposed to patterns, which will need adjustment anyways) are much more difficult to get your hands on. I believe you can find books through the 1930s online at archive.org (where I got most of these)--I just gave my bibliography a cut off of around WWI.